I love heading down to Columbus to visit family because we always eat well when we’re down there, too. Most of the time we make a point to stop at the NorthStar Cafe in Clintonville when we’re in town. They have great food (everything is made in house), a local focus and customer service that rivals Zingerman’s.You order your food at the counter and they bring it to your table. My only small compliant is that at peak hours it can be tough to find a table you don’t have to share with another group. They have a mix of smaller tables and a few large “community” booths that can fit up to 8 or 10 people. On this dinner visit I ordered the Thai Burrito which can be adapted for vegetarians (made with tofu) or carnivores (made with roasted chicken). I opted for the meat version with the rotisserie chicken roasted in house. I also opted for the sweet potato fries in place of the, still delicious, tortilla chips and salsa. 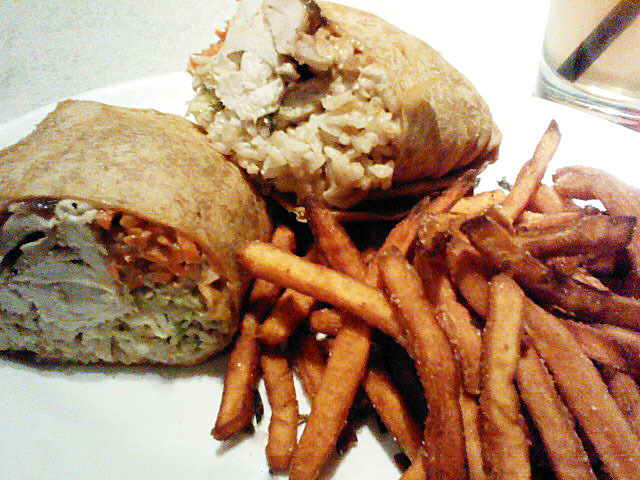 My burrito was stuffed with the chicken, peanut sauce, brown rice and coleslaw. It was large enough that I would have been satisfied with just one-half, but it was so good I was happy to have two! The sweet potato fries were crispy and delicious, not the best I’ve ever had, but far from my least favorite. The atmosphere in NorthStar is always lively and can be a bit loud. Considering you don’t tip the staff, the food prices aren’t too bad for the quality and for the fact that they do bring your food to you. Still a regular stop on our food tour of Columbus. 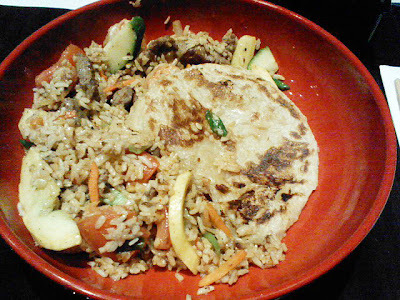 I’d been anticipating the opening of Flat Top Grill, a Chicago based restaurant chain, in the Huron Village shopping center at Washtenaw and Huron Parkway for the last several months. I had fun with their interactive website that let’s you “create your own” virtual stir fry. I received a special email invitation last week to make reservations for a pre-opening charity event. They offered preview meals to email insiders for $5 per person before their official opening on Monday, November 15; all proceeds went to Eli’s Place. My husband and I made reservations last Friday night for 7pm. They were packed when we arrived, but they were well organized and we were seated within a minute or two of coming in the door. The host also gave us a coupon good for a free dessert that night, a nice surprise. Our waiter, Kurt, greeted us enthusiastically and promptly after we were seated. After learning we were “newbies” to the Flat Top Grill he walked us through their process. From past experience, Mongolian Barbecue, and similar restaurants, had made me leery of these create-your-own stir fry places because I feel like the customer is often left to fend for themselves, but still leave a tip at the end of the night. Flat Top Grill has a much better system: they have your wait person meet you up at the stir fry station and take you through step-by-step if you need it. They also had additional staff on hand the night were were there to help you put together your ingredients as well. I wasn’t sure what type of sauce to go with so Kurt was nice enough to ask about some of my tastes and mix a sampler cup of sauce for me to try with peanut sauce, sweet and sour sauce and Jamaican jerk sauce. It was awesome. I added the appropriate proportions to my bowl of white rice, tomato, summer squash and onion. For my protein I chose beef. Shrimp is normally a little extra, but it was free the night we were their for the event so I added that as well. I also added their special bread, called roti prata which was sort of like a thin naan if you’re familiar with Indian cuisine. One of the best things about Flat Top Grill is that you have a wooden stick with your table number and your name penciled in that stays with your dish while it’s prepared so you don’t have to stand and wait for your food. The waitstaff brings your completed dish back to your table when it’s ready so you get to relax with your drink instead. I also appreciated their strong attention to any food allergies. They have special colored sticks that you insert with your ingredients before they’re prepared to make sure the appropriate precautions are taken to avoid contamination. My stir fry was fantastic. The sauce combination that my waiter suggested was even better than I had imagined. The beef came out nice and tender, not dry. The shrimp was fresh and delicious. I loved the texture and taste the bread added to each bite. I’m used to eating most breads on their own, but it was a nice change to incorporate it into the main dish. We chose the Cinnamon Fresh Fruit Roti for dessert. They take their special thin bread coat it in cinnamon-sugar and stuff it with seasonal fruit and creme anglaise. A cherry orange glaze is added to the top and a side of French vanilla ice cream. They also serve two sides of house-made whipped cream. I love fruit based desserts so this was a winner for me. 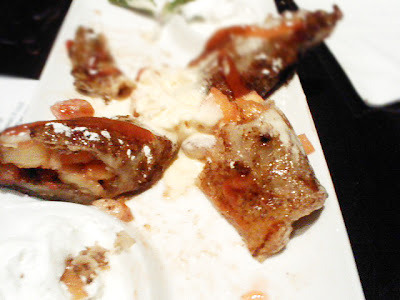 The crisp cinnamon-sugar coated bread and soft fruit on the inside were a nice contrast. The house whipped cream was nice and light and the small scoop of ice cream was just enough without going overboard. For you chocolate lovers they also have an amazing sounding Triple Chocolate Storm dessert to finish your evening. This is how all create-your-own stir fry restaurants should operate. I never felt like I was floundering to figure out how to make my meal. I was able to sit and relax while my meal was prepared and then brought out to me. I felt like service was incredibly attentive and friendly. The atmosphere was fun and lively. I definitely felt it was a place I could feel good about leaving a tip for my server despite the fact that I put my own ingredients on the plate because they created an interactive experience. We’ll be headed their for breakfast tomorrow and I can’t wait to report back on that visit! Yes, you read the name of this restaurant correctly, it really is Tim and Sally’s Awesome Eats. When reading Yelp reviews over the last few months I’d seen it come up a few times and even read the reviews, partly, I’ll admit, because the name is a bit odd so it stood out. I thought about trying it because the reviews of this place were surprisingly positive, but until recently I couldn’t find a website for them. I prefer to check out a menu online when possible before venturing into most new restaurant experiences, especially if I’m not entirely sure it’s food is going to be up my alley. As a website and graphic designer, I cringed a bit when I did finally arrive at their website as it has a homemade feel, but I did my best to ignore the aesthetics and took a look a their lunch and dinner menu. I saw a number of options, all very reasonably priced, that sounded tasty so my husband and I decided to give it a shot last Friday night. Depending on your sensibilities you may find the very brightly colored interior to be quaint and charming, or you may choose to ignore the surroundings and focus on the great customer service and food. It felt like a blend of a coffee shop and diner with a number of tables and a counter with cookies and baked goods featured under glass domes. The colors when we walked in reminded me of the Rainbow Bright doll I had as a child. I’m still trying to decide if this was good or bad, but it was easy to ignore when we were warmly greeted by the wait staff when we walked in and were immediately seated. The menu isn’t fancy, I didn’t expect it to be, but it does give customers quite a bit of choices from burgers, to sandwiches, even some homey entrees. They have daily specials and smoke their own meat in house for the barbecue options. They have a barbecue ribs from their smoker as a Saturday special, that I’ll have to come in and try. I think one of the things that shocked me the most is that they even have a selection of bottled beer and wine. I ordered the Wrapped Sally sandwich, which is a spinach wrap with slices of barbecued chicken (these are not house-smoked), cheddar cheese, tortilla strips, tomatoes, lettuce and ranch dressing. I was pleasantly surprised. Though the meat is not one of their in-house smoked barbecued meats, it was moist and the barbecue sauce pleasantly smokey, rather than sickly sweet. The tortilla strips added a great crunch and texture while the other ingredients were fresh and good quality. You really get the sense that the owner’s care about giving their customers good quality food and service. My husband ordered their Smokey Tim, their house smoked brisket with barbecue sauce on a bun. I stole a bite, it was very good. The time they take to smoke their meats in house makes a big difference. I’m excited to come back on a Saturday night to try the ribs special. It’s not amazing barbecue, but it good barbecue and surprising that you can get this quality in a little diner type place like Tim and Sally’s. 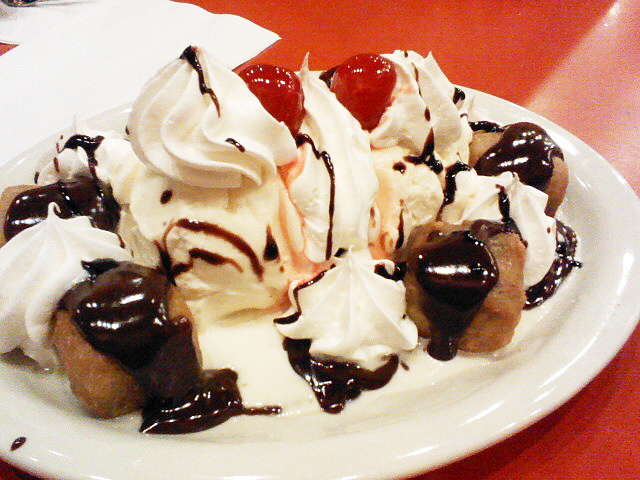 We were enjoying ourselves and our food so we decided to try dessert. I was thrilled to see that they had something called Sally’s Secret on the menu, a daily changing selection of mousse. I’ve been craving mousse lately and notice it’s hard to find in may restaurants these days. I was brokenhearted when the waitress told me that they had stopped making it for now, because it hadn’t been selling well. She said that she would have to tell Sally that she’s had a number of requests, of course, now that its’ off the menu and she should bring it back. The waitress said it is “so good, too”. My disappointment was short lived because we decided to split a dessert that consisted of deep fried banana cheesecake squares topped with vanilla ice cream, whipped cream and hot fudge. It was fantastic! I felt like a kid and really enjoyed it. The banana in the cheesecake gave it a more interesting flavor than plain cheesecake and gave it an extra spark it wouldn’t have had otherwise. When we stepped up to the counter to pay our bill, I believe we were greeted by the great Sally herself. She asked how we enjoyed our meal. I told her that everything was great, but despite the delicious dessert we had this evening that we’d love to see the flavored mouse dessert brought back. Sally asked if we had eaten it before. When I told her that this was our first time in, she warmly welcomed us to her restaurant. We told her we’d definitely be back in. Prices are really reasonable, even if the eats are not quite “awesome”, the food is solidly good and the welcoming mom and pop service certainly is awesome! So, if you check out Tim and Sally’s Awesome Eats ignore the aesthetics of the website and the decor and listen to the reviews. This is a place you’ll return to again and again and be pleasantly surprised. My husband and I went to one of our favorite restaurants in Ann Arbor, The West End Grill, this past weekend to celebrate the five year anniversary of our first date (I know, how cute, right?). I requested the server we’ve had every year we’ve come in the past to enjoy an anniversary dinner, Malia, because she’s fantastic! I was happy to hear when I called on a Tuesday afternoon to make a Friday night reservation for that same week that they were able to accommodate both my late reservation request and our preference for this particular server. It can sometimes be difficult to get reservations at the last minute here because of the limited number of tables. It was a full house when we were seated for our 7:15 reservation. The intimate atmosphere and candlelit tables create a feeling of romance. It can get a little bit noisy when the dining room is at its peak because it’s a small place, but it helps to create a charming and lively setting. Malia made a point of thanking us for arranging to have her as our server when she took our drink order. We started on The West End Grill’s signature and incredible beignet rolls — deep fried rolls that aren’t greasy or too heavy, but have a nice light fried exterior and lightly sweet and soft interior. Watch out, they’re addictive! A few of the servers have been at The West End Grill for a number of years, but I’m still impressed with their recital of the appetizer and entree descriptions from memory. Customers can follow along with the titles written on small chalkboard menu. Although the menu rarely changes, there are plenty of selections to choose from. We passed on appetizers this time, but from past experience I can highly recommend the Honey Mustard Shrimp wrapped in bacon and the Blue Cheese Tarts. Even if you don’t order an appetizer you’ll be full by the end of the meal. The basket of delicious rolls and a choice of soup or salad come with each entree. On this visit I ordered the Petit Fillet with a salad sprinkled with blue cheese crumbles and the roasted garlic vinaigrette. For some reason I was not as impressed with the salad as I have been previously. The greens were fresh, the grape tomatoes and blue cheese were good, but the dressing didn’t seem to have as much flavor as I had remembered. It seemed a little heavier on the oil and had less garlic flavor than I would have liked. The fillet was a perfect medium rare and melted in my mouth. 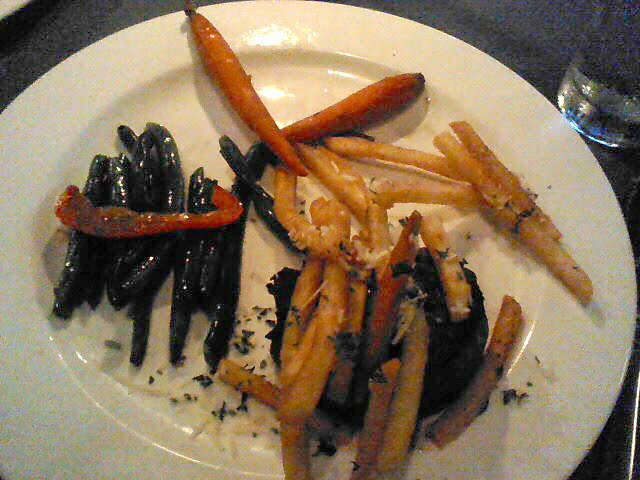 It came with green beans, two baby carrots and parmesan truffle french fries. The beans were cooked just the way I like them, crisp, but not too soft. The carrots were a bit crunchier than I would have expected and made a better garnish than a side vegetable. The fries, I have to admit, initially hit me as glorified fast food fries. They had a similar cut and crunch typical of many burger places, but the flavors grew on me quickly. The salty parmesan and the complexity of the truffle oil set in after a couple of bites and I was hooked. I also stole the roasted asparagus that came with my husband’s scallop dish. He’s not a fan of many vegetables so it worked in my favor this time. The asparagus was perfectly roasted and seasoned. Malia was kind enough to offer us our choice of champagne or dessert on the house because of our anniversary celebration. We chose dessert, but I have to admit that even with my strong sweet tooth, most of the desserts offered didn’t really interest me. They had key lime pie, sticky toffee pudding, carrot cake, a nut based brownie with ice cream and molten lava cake. We went with the molten lava cake. It came with a pairing of chocolate and a berry sauces on the dish and the cake was topped with a fresh strawberry. The exterior of the cake was a little under-sweet, but when you hit the center the rich bittersweet chocolate melted and made it worthwhile. I wasn’t knocked over by this dessert, but I also prefer my chocolate with another strong flavor like caramel or raspberry and there just wasn’t enough other flavors to balance the chocolate out for me. I love coming here for the great service and good food. The romantic atmosphere makes it a nice choice for a celebration dinner. The Northstar Cafe in Coumubus, Ohio is another restaurant that has consistently good food, service and makes an effort to use local ingredients. Their prices are a bit on the high side, but you do get really good food. After catching a movie we decided to grab a late dinner on the way back. I wasn’t sure if the Beechwold area Northstar would be open after 9pm on a Friday, but we decided to stop by. We got their around 9:45 and they close their doors at 10pm. I was glad we caught them; they didn’t even seem to mind having last minute customers. We ordered our food at the counter. 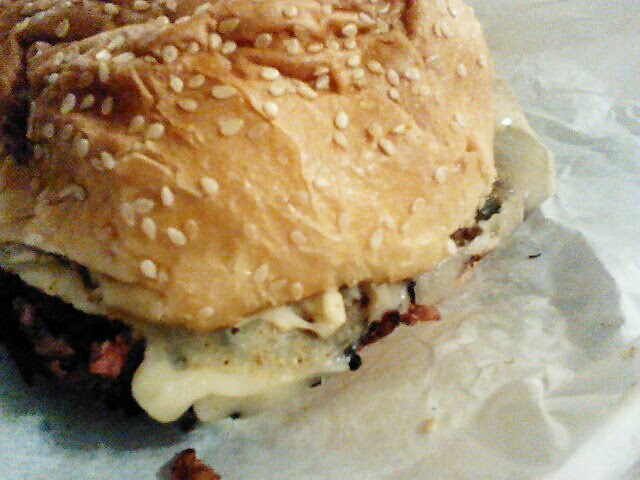 I got their famous Northstar Burger ($11.50), a veggie burger that is said to convert carnivores, and it truly does. My husband who cringes at the word vegetarian often orders this burger when we come here. It has a very “meaty” consistency that makes you forget your eating a meatless burger. It’s made with organic brown rice, black beans and beets and comes standard with white cheddar, lettuce, tomato, pickle and onion and their Simple Salad on the side. You can also substitute any of their other sides, if you prefer. I had the standard Simple Salad side which does fit its title. It’s an easy mix of cabbage and salad greens (maybe a bit heavy on the cabbage for those who aren’t a fan), house croutons and the house citrus vinaigrette. It is truly simple, but a nice compliment to the very flavorful burger. This is another place in Columbus that is a packed house most of the time. You have to fight for an individual table or share “community” tables with strangers. We lucked out by hitting them at the end of the night on the visit and taking our food to go. We didn’t have to wait long for carryout though the tables were mostly empty anyway. Because the prices are so high here, I’d rather spend my money at a place like Black Creek Bistro, but it’s a nice treat for take-out once in a while. My husband and I were really excited about eating at Brand BBQ Market when we visited Chicago last week. I had seen good online reviews and there menu was an unusual mix of traditional and unusual flavors for barbecue. We went on a Monday night around 7:30pm. There were only a couple of other customers, but the service was slow and unenthusiastic. Up until then I thought it was hard to find poor service in Chicago because there are so many restaurants competing, but I was wrong. It certainly was not the worst service I’ve received by far, but it left a lot to be desired in a town of unending restaurant options. 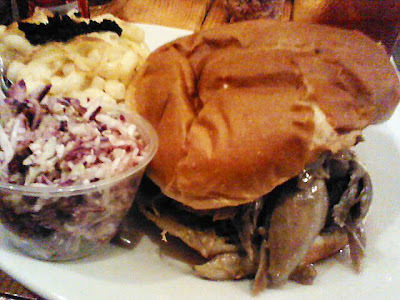 I ordered the pulled duck sandwich confit style with a side of burnt ends mac and cheese and coleslaw. The duck was greasy and lacked flavor of quality barbecued meat. The Sweet Southern Peach barbecue sauce was the saving grace; it had a nice sweetness level and was the only way to add flavor to this sandwich. The burnt ends topped mac and cheese was really tasty and interesting. The “burnt ends” which are the dark smoked tips of the brisket are coveted by many barbecue connoisseurs. They also use an uncommon mix of smoked Gouda and sharp cheddar adding a rich complexity. The coleslaw was vinegar based and uninteresting. The cabbage was too finely chopped and the dressing was minimal. They only serve one option for dessert, which changes daily. They may want to consider expanding that to include two or three more selections. Overall, I was unimpressed. Slow’s BBQ in Detroit is ten times better than what I had that night, and with much better service. 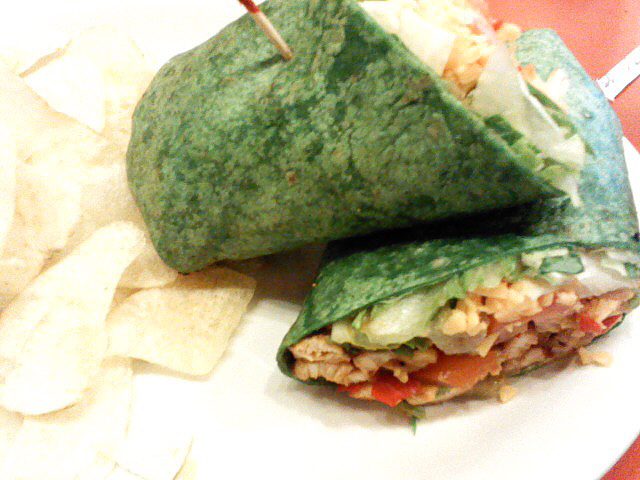 After having a both great lunch and breakfast experiences at Nico and Vali’s in Plymouth, I was excited to try dinner. The service was great as usual. For dinner we had a nice young man who was very familiar with the menu, enthusiastic and very attentive. 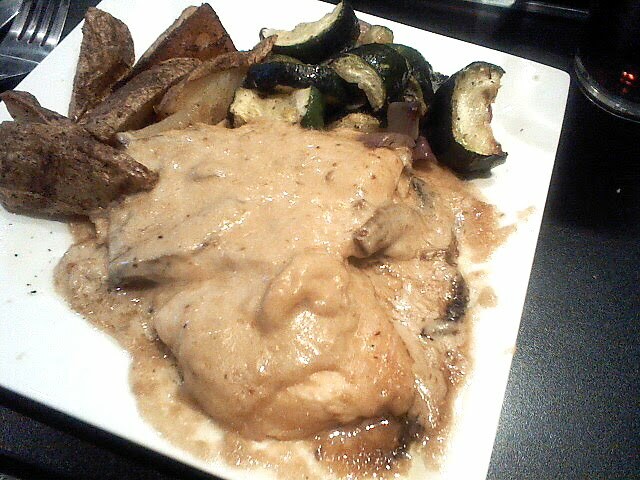 After looking over the specials I decided on the Chicken Marsala with roasted potatoes and sauteed zucchini for $8.95. I also added a half Caesar salad ($3.50). Apparently, the specials do not include a choice of soup or salad, but the traditional family plates do. 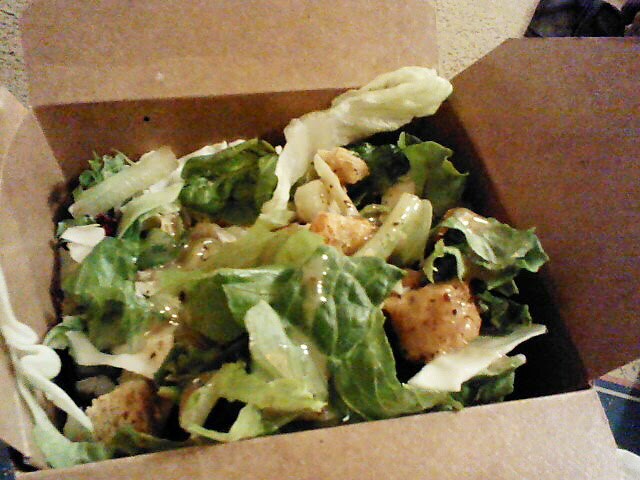 The Caesar salad was nicely coated in dressing without going overboard. 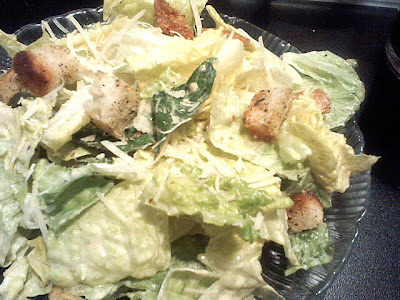 The romaine leaves were crisp and fresh and topped with croutons. I sampled a bit of my husband’s soup, la stracciatella, which had a chicken stock base with a touch of egg, small beads of pasta, chicken and vegetables. The slight egginess of the broth came through as a nice flavor. 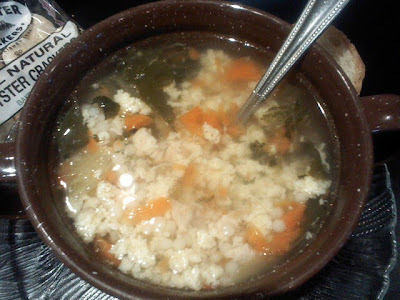 The soup could have used a touch more salt, but would make a great comfort food. I was rather disappointed with the Chicken Marsala. It arrived drenched in a rich, heavy cream based sauce. The sauce preparation I’m familiar with in this dish is much lighter and with ore emphasis on the wine with just a touch of cream. The very thin chicken cutlets were on the dry side as well. The roasted potatoes and zucchini were tasty, but needed more seasoning. My husband liked his gnocchi with meat sauce, but also felt it was under-seasoned. I had originally planned on choosing from the “Family Traditions” section of the menu, but was enticed by the special; maybe that’s where I went wrong. Given the excellent lunch and breakfast food we had before this visit, we definitely plan on going back and assume that this was just an off night for the kitchen.I’ll have to try one of the everyday dishes next time.